Artdaily, London.- Appearing on the market for the first time since it was gifted by Sir Winston Churchill to his bodyguard Sergeant Edmund Murray, The Goldfish Pool at Chartwell is the final work that Britain’s greatest war-time leader ever painted. 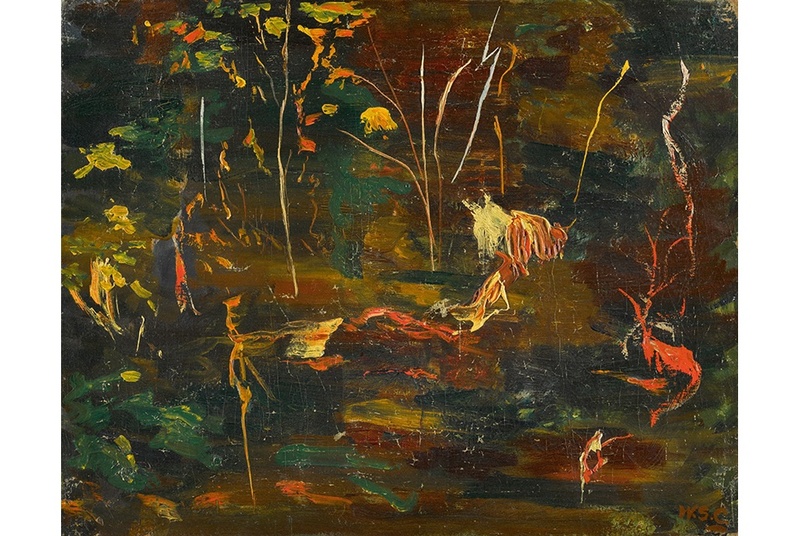 The work depicts the beloved goldfish pool in the garden of Churchill and his wife Clementine’s home at Chartwell – the place most closely linked to his development as a painter. A unique and moving insight into his final years, The Goldfish Pool at Chartwell will be offered with an estimate of £50,000-80,000, as part of Sotheby’s Modern & Post-War British Art Evening Sale in London on 21 November. Winston Churchill discovered painting when he was 40, in the wake of the debacle of the 1915 Dardanelles campaign, which, as First Lord of the Admiralty, he had been responsible for instigating. From this moment on, painting was to form an essential part of his life and he rarely travelled without his paint-box – a passion that would endure far in to old age. On many occasions, he remarked that the “Muse of Painting came to his rescue”. Having never sold a work during his lifetime, the vast majority were given by the artist to friends, colleagues, employees, foreign dignitaries or family members. This painting was gifted to his bodyguard Sergeant Edmund Murray, who served with him from 1950 to his death in 1965, and who provided much support and encouragement in setting up his easel and preparing his brushes. Murray remembered that the final occasion Sir Winston used brushes was at Chartwell around 1962 – one of his favourite places providing a fitting subject for his last painting. Churchill’s works at Chartwell are highly sought after, with the world auction record of £1.8 million achieved for a masterpiece from 1932 focusing on the same subject, which sold at Sotheby’s in 2014 having been in the collection of his daughter, Mary. Extract from the Artdaily article titled “Sotheby’s to offer Sir Winston Churchill’s final painting”. Image : Sir Winston Churchill, The Goldfish Pool at Chartwell, oil on canvas, circa 1962 (est. £50,000-80,000) © Sotheby’s.